What they do not tell you is that the air at the top is all but unbreathable; this is why, when you get there, you are most likely alone. Neither intimidated by the height nor so awed by the view that you believe yourself unworthy of it, you are a coil of stamina, your body, with its raised and rounded scars, a rosary of wounds. Sometimes, you can feel the fingers of God grazing each one like a sanguine bead. He knows what still hurts. Faith is the height of reason here; there is no one left to contest you. At the top, where even breath is begrudging, it is clear how little mankind controls. You understand that you are not just blessed but also someone who will always be earning her air. This is your rightful place; soon you’ll stop apologizing for it. Success is not what sets you a-tremble. Planting the conquering flag does not frighten you. No, you are apprehensive of the attention its waving will attract. Leaving your writing in the crevices of caves, in the craters of wailing walls, is one thing. It is simple to be entirely honest with only the ether as audience. On the side of a mountain there is anonymity; to remain unknown is to be left to oneself. This is tempting, but it does not gratify. Still, what will you do about these new encampments, these people who are looking up from the bases of boulders and watching to see how conquerors comport themselves? What of the voyeurs and the vultures? Now, someone will always be circling. Accept the evidence that you’d always prepared yourself to be here today. You pined for it, placing so many pieces of yourself in corners and creeks so that someday, enough of them were bound to be found. Piece together the leafs and there is the book you have always been destined to write, collect the watery daguerrotypes embedded in ditches and there is your photonarrative. There was enough of you here for a retrospective, even if the climb killed you, there may have been some posthumous acclaim. You pretended to others it wouldn’t matter; climbing is its own recompense, the work its own reward. But this was a mere insulation. You’ve always wanted to be known. Recognition holds the same rush as rappelling and readership is the same as a rope: you cannot reach the top without it. Your fear is to be poorly received, to become known not for the beautiful boom of your voice from the top of a great height, but for the tinny emptiness it may echo when it reaches the ground. In the past, you have protected yourself from chilly reception by behaving as though you shouldn’t be where you are at all, that your presence at one pinnacle or the next is all but miraculous, that talent is a mere sleight of hand. You understand, now that you can see the true distance of a descent, how unwise it is to pretend your own unworthiness for so long. You will convince yourself of it, and even now, from time to time, you are still beguiled by the idea of flinging yourself down. From this height, you can see other far off climbers, standing atop higher peaks, dancing, so deep-breathed and darling, their beckoning calls a kind of dare to those still below. There is room for us all, they are calling. But we never really know if this is true. We do not know who will tug at our harnesses and tethers, endangering us to leverage themselves. We remain unsure who comes not to build but to topple. It can make you uneasy, being watched and clambered toward, a bastion to expectation. You do not have your own advice to offer down the mountain — not really — but you give some anyway, as often as you’re asked, and you hope it works. You hope you work. With every rising sun, you tamp down your deprecation and reacclimate yourself to this air. 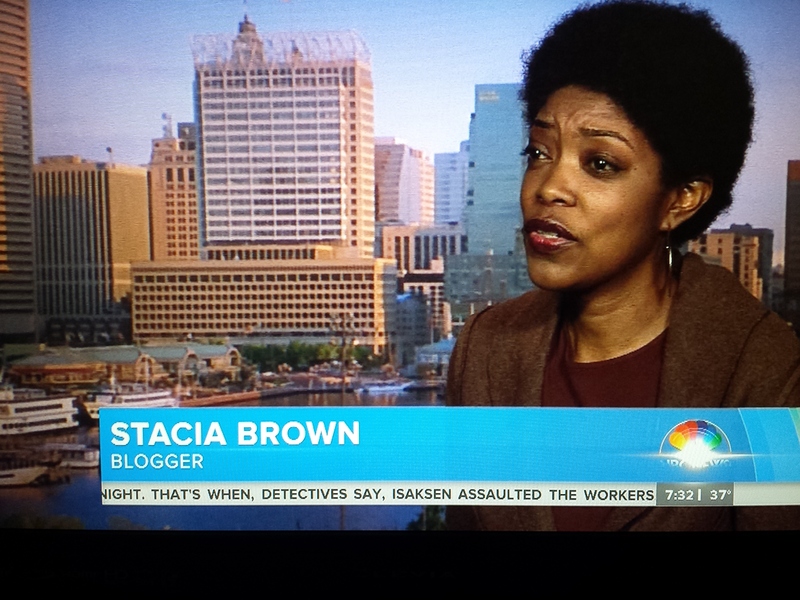 Stacia L. Brown on HuffPost Live! Sept. 7, 12:50 pm EST! Apologies, friends. I’ve got to make a temporary departure from thoughtful, decently crafted posts to geek out for a moment. I’M GONNA BE ON THE NEWLY LAUNCHED HUFFPOST LIVE TOMORROW!!! Excuse the all caps, but this is pretty wild. A little over two months ago, I wrote this. And this afternoon I got an email inviting me to discuss black mental health on HuffPost Live tomorrow, Sept. 7 at 12:50pm. It’s a twenty-minute segment, hosted by Marc Lamont Hill, and I’m really honored to have been asked. It isn’t just the show (although that’s an amazing opportunity); it’s about what it represents for me. 2012 has been a crazy year. I started it by stating that I had expectations for it. I don’t often do that, make grand declarations at the top of a year, prognosticating a favorable future and actually hoping I’m right. But I did it this year. And, if God wills, I’ll keep being right. From May until the end of August, I was a daily contributor at Clutch magazine, which led to my work being republished at The Root and, one dizzying time, at Salon. Needless to say, my visibility as a writer increased, which has always been one of the deeper desires of my heart. It’s a heady, blissful sensation, working really hard on a piece of writing and watching it land with a large cross-section of people. But I’ve always stopped short of pursuing the “brass ring” kind of opportunities. National mag pitches. Spec TV/film script pitching. The aggressive pursuit of a book sale. Speaking engagements. Personal branding. Concurrent with those issues, though, my ideas about possibility and self-worth and self-acceptance have been expanding. It’s the kind of work you should ideally do in your teens and twenties, and work that some women (and men, really) count themselves blessed to accomplish at all. My work began when I had my daughter. I started believing I could inhabit a much larger space than that which I’ve allowed myself till now, because I’ve promised her as much for herself, and in order for her to trust me, she has to see me do it. But believing and bulldozing the cement walls are different endeavors. Coming up with an approach to the latter remained a mystery. Sometimes the approach finds you. This is probably the first year of my decade-plus career as a writer that people have sought me out to write or to discuss things I’ve written, rather than me frantically searching for outlets willing to publish me. And more than any other time in my life, my work has been resonating with a large cross-section of readers, people from different walks of life, people with wildly divergent philosophies, people who I wouldn’t have ever imagined taking notice of the work I do. It’s also been met with far more criticism than it’s been before (in part because it’s been more widely published). And I’ve had ideas. Oh, the ideas. Grand, sprawling, lavish, daring ideas, which for the first time ever, I feel capable of implementing. All these experiences have converged at just the right moment. It’s the moment I’m finally, mercifully prepared to handle them. At any rate, if you can, tune in to HuffPost Live tomorrow at 12:50pm EST and watch the 20-min panel discussion on mental health in the black community. I’ll be there.